Kogawa House cherry tree at Vancouver city hall is given a plaque on the 20th anniversary of the Japanese-Canadian redress. 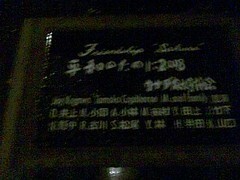 “Friendship Tree” plaque at Vancouver City Hall for the “Kogawa House cherry tree” graft – photo Ann-Marie Metten. Sixty-six years ago, in 1942, Japanese-Canadians were “evacuated” from Canada's Pacific coast and sent to internment camps for the duration of WW2. 2005 was a busy year for Joy Kogawa. Obasan was the “One Book One Vancouver” selection for the Vancouver Public Library. “Naomi's Road”, a mini-opera based on her children's novel debuted by the Vancouver Opera Touring Ensemble. And the childhood home of Joy Kogawa, which she had always hoped her family could return to after the war, was threatened with demolition. And on November 1st,at Vancouver City Hall, there was the Joy Kogawa Cherry Tree Planting”. Then city councilor Jim Green accompanied Joy Kogawa in turning the sod. Jim had helped Joy take the original grafts from the tree a year before. They were accompanied by Vancouver chief librarian Paul Whitney, and Vancouver Opera managing director James Wright. Now there is a plaque to officially recognize and commemorate the significance of this young cherry tree. It is grafted from the original cherry tree from Joy Kogawa's childhood home. the processing of the demolition permit by 3 months. read Kogawa House: Vancouver Council votes unaminously to create 120 day delay to demolition application. In May of 2006, The Land Conservancy of BC purchased the house at 1450 West 64th Ave, to help preserve the childhood home of author Joy Kogawa. In April 2008, Joy released a children's picture book titled Naomi's Tree. It encompasses the stories of the WW2 internment, and also the saving of her childhood home, while reflecting on the friendship of a young child and cherry try as they both age and meet again. This book tells the story of the “Friendship Tree,” Joy Kogawa reads “Naomi's Tree” at Vancouver Kidsbooks for the Vancouver book launch. It seems very fitting that a plaque at Vancouver City Hall be placed at the baby cherry tree on the 20th anniversary of the Japanese-Canadian redress settlement. This entry was posted in Asian Canadian Cultural Events, Canadian Identity & Heritage, Joy Kogawa & Kogawa House, Literary Events, Main Page, One Book One Vancouver: Joy Kogawa's Obasan, Vancouver Heritage and History on September 22, 2008 by Todd. Joy Kogawa, author of Obasan, has written A Place of Compassion for her submission to the Dream Vancouver conference and website, organized by Think City. While Joy will not be attending the conference, I will be as one of the directors of the Joy Kogawa House Society. change. The conference will be facilitated by Bliss Browne, internationally-renowned speaker and president of Imagine Chicago. Former City of Vancouver Co-Director of Current Planning Larry Beasley is key note speaker. to a collective vision of what the city could be. To attend you must register, click here. Location: Jewish Community Centre, 950 W. 41st Avenue, Vancouver (at Oak Street). Is Joy a Vancouver dreamer? She was born in Vancouver in 1935. During WW2 in 1942, when she was 6 years old, her family was removed from Vancouver and sent to internment camps for Japanese-Canadians. She forever dreamed about returning to the the house in Vancouver's Marpole neighborhood, even after the Canadian government confiscated the property of the Japanese-Canadian internment victims, and resettled them to work as labourers on Alberta beet farms. She lives mostly in Toronto but returns to Vancouver often, and has great hopes for Vancouver as a city, and as a cultural entity. Joy is acknowledged as one of Canada's most important writers in the 20th Century for her ground breaking novel Obasan – a story about the impact of the internment on the Japanese Canadian community. Since May 2005, when I met Joy, at the first Obasan event for One Book, One Vancouver event at the Vancouver Public Library, our developing friendship was been a wild ride as I became a key player on the Save Kogawa House committee (See my articles on Joy Kogawa & Kogawa House). I have witnessed Joy speak in numerous circumstances and she always seems to have an unwavering position that calls for peace and compassion in so many circumstances. It embraces her anti-war stance, the Japanese-Canadian redress, South African apartheid, the Chinese-Canadian head tax issue, Japanese atrocities against China in WW2, the history of her ancestor's home of Okinawa, the naming of the 401 Burrard building after Howard Green. Joy doesn't look to find blame for right or wrong, she looks to find resolution. Vancouver has long had a reputation for a history with peace activism. This is part of our social-cultural make up, and can be embodied through social policy initiatives. Perhaps it has become such because so many people have come to Vancouver after leaving war, destruction, starvation, revolution, upheaval in their home lands. On November 10th, come to the 2nd open house event at Kogawa House. Admission is by donation. Proceeds go to restoring historic Joy Kogawa House, now owned by The Land Conservancy of BC. time than this to abolish war as we face our common planetary fate? ways of truth and reconciliation, cooperation and peace. corners of our hearts and the world. against us during the Second World War were dreaded in our community. peace making and for walking on. many voices that call us. This entry was posted in Joy Kogawa & Kogawa House, Main Page, One Book One Vancouver: Joy Kogawa's Obasan, Upcoming Events, Vancouver Heritage and History on October 17, 2007 by Todd. I was invited to meet with two of the researchers, North American director DeNel Rehberg Sedo (Mount Saint Vincent University, Canada), and Anouk Lang post-doctoral fellow. I quickly contacted Larry Wong, as we were the community representatives/experts on the inaugural One_Book_One_Vancouver program in 2002 which featured The Jade Peony by Wayson Choy. We were great additions to the OBOV committee as Larry was a childhood friend of Wayson, and I was a vice-president of Asian Canadian Writers' Workshop, and also volunteering with Asian Heritage Month in Vancouver. Here's a picture of (l-r): Larry Wong, Wayson Choy, Anouk Lang, Todd Wong (me) and DeNel Rehberg Sedo – photo courtesy of Larry Wong. The Beyond the Book project seems to be a fascinating study of the mass book clubs for an entire city, such as One_Book_One_Vancouver, CBC Radio's Canada Reads, Seattle Reads, and One Book One Chicago. It was a great privilege to be part of the inaugural One Book One Vancouver project. I was invited by Community Programming Director Janice Douglas. Also on the committee was Corrine Durston, then the Division Head Librarian for VPL Popular Reading, and Lisl Jauk, manager for The Word on the Street Book and Magazine Festival. It was an excellent exercise in community networking, as early meetings also included the VPL communications staff, as well as a representative from Douglas and McIntyre Pulishing, which published The Jade Peony. Our discussions acknowledge the incredible creative energy of our inaugural commitee, which recognized that we were on an adventure and creating something brand new, never before done in Canada. We created programming to help make The Jade Peony come alive. DeNel really liked my phrase “to turn the book inside out.” Larry highlighted “The Jade Peony Walking Tour” that was created by Vancouver historia John Atkins, and was organized through the Dr. Sun Yat Sen Gardens. Wayson Choy spoke about the One Book program from an author's experience. During the program, Wayson was simply amazed as The Jade Peony, was pushed back up on the BC Book Publishers' “Best Seller” lists. Wayson stated that OBOV (Jade Peony) committe was an important and unique program, devoid of egos, but especially strong because of the presence of community activists, and strong connections throughout the community. I emphasized how incredible the event “Dim Sum with Ways Choy & Friends” was. I had scouted the Floata Chinese restaurant as the best possible site. Larry invited friends of Wayson's who had been the basis for some of the composite characters in the story. As well, Larry showed a video greeting from author Carol Shields, who had been one of Wayson's teachers at the UBC School of Creative Writing. I also recounted setting up reading events titled “Stories from Chinatown” featuring authors Paul Yee, SKY Lee, and Jim Wong-Chu, as well as “More Stories from Chinatown” featuring poet Sean Gunn, historian enthusiast Dr. Wallance Chung, and Roy Mah – founder of Chinatown News. I also commented about the programming for the 2005 One Book One Vancouver selection, which was Joy Kogawa's novel, Obasan. Early in January, 2005, I wrote a letter on the Kogawa Homestead website stating 20 reasons why Obasan should be the 2005 OBOV choice. By September 2005, I was an active member and coordinator for the Save Kogawa House campaign to rescue Joy Kogawa's childhood home from demolition, and to turn it into a national historic landmark for all Canadians to share. check out my articles on the OBOV program featuring Joy Kogawa's novel Obasan. This entry was posted in Asian Canadian Cultural Events, Literary Events, Main Page, One Book One Vancouver: Joy Kogawa's Obasan on June 14, 2006 by Todd. This morning the Save Kogawa House committee met with federal Health Minister Ujjal Dosanjh who is MP for Vancouver South which includes the child hood home of Joy Kogawa at 1450 West 64th Avenue. City Councillor Ellen Woodsworth accompanied us as an advocate. government due to the internment of Japanese Canadians in 1942.
achivements as an important Canadian author and literary figure. ago, but also admitted to not having finished reading the book. arrange for Veera to perform at his 2004 fundraiser event. And we invited him to listen to CBC Radio Sounds Like Canada on Dec.
the Save Kogawa House campaign, and her literary career. Finance Minister of the provincial Liberal government. This entry was posted in Joy Kogawa & Kogawa House, Main Page, One Book One Vancouver: Joy Kogawa's Obasan on December 20, 2005 by Todd. campaign to acquire the house and secure its protection. been listed by the Literary Review of Canada as one of the 100 most important Canadian books ever written. November 30) to give the community time to raise the funds to buy it. cherry tree at Kogawa House, as Mayor Larry Campbell proclaimed Obasan Cherry Tree Day on November 1. TLC’s Turner said that the fundraising campaign is underway. www.conservancy.bc.ca, or by calling our Lower Mainland Office at (604) 733-2312 or our Head Office in Victoria at (250) 479-8053. This entry was posted in Joy Kogawa & Kogawa House, Literary Events, Main Page, One Book One Vancouver: Joy Kogawa's Obasan, Vancouver Heritage and History on December 3, 2005 by Todd. Nikkei Centre in Burnaby – just off Kingsway. It's a wonderful production, full of hope and tears, great singing, staging and acting. Tickets: Youth $10, Adults $15. Festival seating. or at the door on the day of the event. This entry was posted in Asian Canadian Cultural Events, Joy Kogawa & Kogawa House, Literary Events, Main Page, One Book One Vancouver: Joy Kogawa's Obasan, Upcoming Events on November 23, 2005 by Todd. This past week CBC Radio host Mark Forsythe of BC Almanac, has been promoting his new book Almanac's 100 Greatest British Columbians. This is a BC Version of CBC television's The Greatest Canadian. The names are all listed by categories with no numerical value. BC's top ten literary writers include Joy Kogawa, George Bowering, Wayson Choy, Dorothy Livesay. The book is published by Harbour Publishing. This entry was posted in Joy Kogawa & Kogawa House, Literary Events, Main Page, One Book One Vancouver: Joy Kogawa's Obasan, Vancouver Heritage and History on November 20, 2005 by Todd. major centre for Canadian and international writers. the Vancouver Public Library for its One Book One Vancouver program, encouraging all Vancouverites to read this single book. National Association of Japanese Canadians.